It’s been a while since I’ve used my grill, but a recent trip to Northern California inspired me to come back home and clean off my backyard bad boy for another summer of good eats. The lunch I made for my buddies up north was inspired by Nadia’s favorite grilled dish of mine, “The Summer Picnic.” We call it that because I made it for her one summer night and the name stuck. 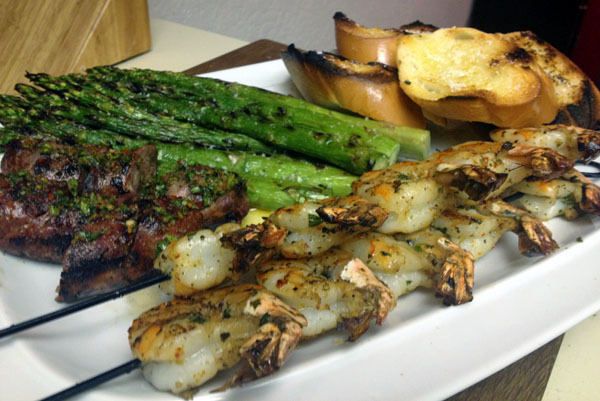 Basically it’s grilled shrimp, grilled asparagus and some bread. I pierce the shrimp twice, through the head and near the base of the tail, to make the skewers easier to flip. 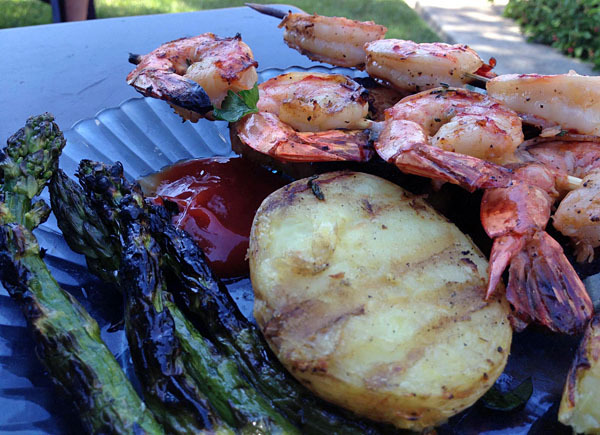 As far as shrimp go, most would say sustainable is best, but it’s also pricey. You get the best bang for the buck at Costco, where the shrimp in the meat/seafood section are huge. I think I paid about $18 for 24 large shrimp. But they’re also farmed … so is the majority of the rest of the shrimp you and I are likely eating though, so I dunno. Finally, I’ve read that it’s better to buy frozen than fresh in most cases. Unless you’re buying at Pearson’s Port (or sometimes Santa Monica Seafood), most of the shrimp you purchase is frozen on the ship at sea. The market then defrosts it to display it, so what’s the point? Lately, I’ve switched to frozen Northern Chef wild caught baja shrimp, 40-60 count in a 1 lb. bag for about $10 at Sprouts. Omit the bread to save on the carbs, but if you plan on using it, you can serve it fresh or grilled. French is best, but you can also use italian. Slice the baguette or loaf into slices, and if grilling, brush lightly with olive oil (or garlic/herb-infused olive oil) and cook on the grill very briefly. Watch it close, because it burns quick! -Wrap the asparagus pre-grill in bacon or post-grill in prosciutto. -Throw some sausage on the grill too! My favorite is the pork sausage at Puerto Madero in Santa Ana/El Gaucho in Anaheim. Just like the bacon/prosciutto idea above, it’s not the healthiest idea, so save it for a sporadic treat. Finish with a drizzle of chimichurri, also available at the market (I like to leave off most of the oil and just use the herbs instead). -Par-boil some halved yukon gold potatoes for about 12 minutes, until nearly fork tender. Finish face down on the grill, turning 45-degrees once in the cooking process. The chimichurri also works great here, or toss with a tablespoon of melted butter (plus sauteed shallots, a lot of garlic and parsley, if you’d like). Salt and pepper to taste. -Other vegetables would also work here–spring onions, ramps, broccolini, brocolli rabe. We just alway use asparagus because it’s so yummy. -Finish the veggies and the shrimp with a solid spritz of fresh lemon juice and fresh chopped flat-leaf parsley.